Find the best price forTart it Up! 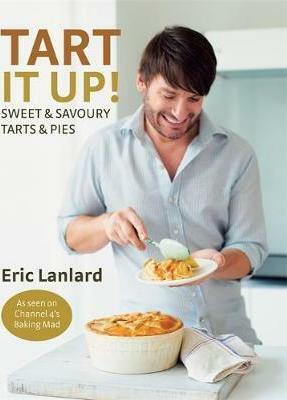 From a 'proper' quiche Lorraine to an indulgent raspberry cheesecake pie, Eric Lanlard, bestselling author of Cake Boy, shares his secrets for creating great pies and tarts every time. Pies and tarts are the ultimate comfort food.Whether sweet or savory, elegant or hearty, they are great for relaxed entertaining, family get-togethers and even weekday suppers. In this irresistible book Eric Lanlard, AKA Cake Boy, demonstrates how to make the best pastry and shares his favorite recipes for sweet and savory tarts and pies. His recipes include classics with a twist plus ideas inspired by his travels, using deliciously imaginative flavor combinations. In the first part of the book, Pastry Basics, Eric shares his professional expertise and provides step-by-step instructions for making every type of pastry - shortcrust (sweet and savory), puff, almond, chocolate and brioche. There is a wealth of helpful baking hints to ensure a great bake every time. In addition to the recipes in Savory Tarts & Pies and Sweet Tarts & Pies, there's a selection of quick bakes using ready-roll pastry plus delicious accompaniments and side dishes.With foolproof recipes for tarts and pies that look and taste great, this wonderful book is a great way to bring some of Eric's culinary magic into your kitchen every time you bake. Compare New Book Prices for Tart it Up!